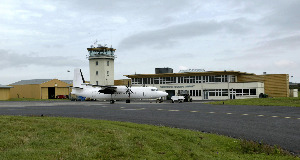 Private investors willing to put funds into Waterford Airport will not “hang around while the Government licks their pencils and commission further reports” into making a business case to revitalise the facility. That is according to WIT School of Business lecturer Ray Griffin, who was reacting to Transport Minister, Shane Ross’ comments that although the Government wants Waterford Airport “functioning, commercial and viable”, it did not “want to create a white elephant”. The airport has been without any commercial flights since mid-2016. Management has submitted a proposal to extend the runway, which it says would considerably enhance the airport’s commercial appeal and attract new carriers, having been without any commercial flights since mid-2016. Fianna Fáil TD, Mary Butler, said extending the airport’s runway was imperative for regenerating the south-east economy, and that private investors were willing to fund €5m, and local authorities a further €3m, if the Government would commit €5m. Mr Ross said he appreciated “the energy Waterford Airport could inject into that region” but said the Government had to look at its regional policy and decide on that basis whether investment is worthwhile or not. Mr Ross said a decision “on a very sensible and prudent basis” would be made in the coming weeks. WIT’s Mr Griffin said the decision was being long-fingered to the detriment of the region, claiming it was indicative of Government apathy towards the region. “There is a material difference between what the Minister is saying and what he is actually doing. The clear and unambiguous promises made to the South East in respect of the regional airport, cardiac care, hospital groups, higher education and the North Quays development are all being walked back on. “This is how Irish politicians say no, they never actually utter the words, instead what you hear is the sound of a consultant being hired to do a further study. It is unclear how long the Government expects private investors to hang around while they lick their pencils and commission further reports. Knock Airport announced its €11.2m runway revamp at the weekend, the first in 34 years, that will see a complete resurfacing among other works. The project is being 75% funded by the Government, with the airport funding €2.8m of the total. Ms Butler said that although “apples could not be compared with apples” as Knock carried hundreds of thousands more passengers than Waterford ever did, nevertheless it showed how a revamped airport in the south-east could help rejuvenate the area economically. I am actually confident that Minister Ross realises Waterford Airport is vitally important if we are to become a viable regional balance to Dublin. “We have the North Quays development, cardiac care, the tech university and the airport — if we can chip away at all of those, we can make Waterford what it should be.